Please be patient and allow for the podcast to load and start up. In the instance of most videos, streaming will allow for an allotment of 10 to 40 seconds buffering time to start the video. Some large videos may take slightly longer, depending on your current download speeds with your internet provider. Welcome to the PAAM – VAWP Podcast. Today I'll be chatting with Cpl. James Isaacs from the Dearborn Police Department. Cpl Isaacs is an expert in cell phone technology and cell phone forensics. In this segment we'll discuss how technology needs to be made part of the safety planning discussion with victims. If you are a prosecutor in need of technical assistance regarding domestic violence, sexual assault, stalking or intimate partner violence, feel free to contact me at 517-334-6060 ext 829. Welcome to the PAAM – VAWP Podcast. Today I'll be chatting with Ms. Lore Rogers, Staff Attorney of the Michigan Domestic and Sexual Violence Prevention and Treatment Board. We’ll be talking about the benefits prosecutors and law enforcement can have from working collaboratively with community based advocates. Ms. Rogers has also worked as the interim co-director of the sexual assault prevention and awareness center at the university of michigan, as the director of domestic violence and sexual assault services program at the YWCA of greater Flint in Michigan, and as the legal advocacy director at domestic violence project, inc./safe house in washtenaw county, michigan. 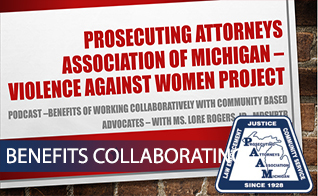 Lore also worked as a domestic violence grant coordinator and pretrial probation compliance officer with the washtenaw county trial courts. She has extensive background providing direct services to survivors of domestic and sexual violence, as well as teaching and training on issues of intimate partner and sexual violence. She has designed and conducted training on the nature and prevalence of domestic violence; domestic violence laws; law enforcement response to sexual assault crimes; confidentiality and safety; personal protection orders; effective interviewing and assessment of survivors and batterers; working with survivors of domestic violence in family law proceedings; and the impact of domestic violence on children. Lore has done extensive work on projects addressing unsubmitted sexual assault medical forensic kits in the State of Michigan and pilot tracking projects for these kits. in addition to her work in Michigan, Lore has served as faculty at state and national conferences on domestic violence or sexual assault. Before becoming directly employed in the domestic and sexual violence arena, Lore worked as a civil trial attorney for 13 years. If you are a prosecutor in need of technical assistance regarding domestic violence, sexual assault, stalking or intimate partner violence, feel free to contact me at 517-334-6060 ext 829. Welcome to the PAAM – VAWP Podcast. 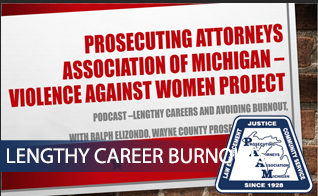 Today I'll be chatting with Ralph Elizondo of the Wayne County Prosecutor's Office. Ralph has enjoyed a 28 year career in prosecution; 20 of those years working in the Special Victim's Unit and prosecuting sexual assault cases. We discuss recognizing signs of burnout, tips to prevent burnout, and managing burnout. 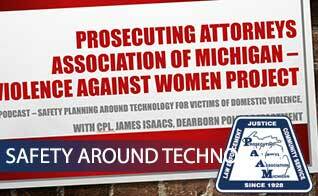 If you are a prosecutor in need of technical assistance regarding domestic violence, sexual assault, stalking or intimate partner violence, feel free to contact me at hagamanclarkd@michigan.gov or 517-334-6060 ext 829.